Each and every day we live and travel in a place filled with Native American names, and never think about the people who bequeathed us their heritage. From the late 1500’s though the arrival of the Europeans in 1620, the Merrimack Valley was a type of Eden to various Native American tribes. It all came to an end, because of inter tribal warfare, European plagues that killed upwards of 80-90% of the native population and the overwhelming numbers of European settlers. 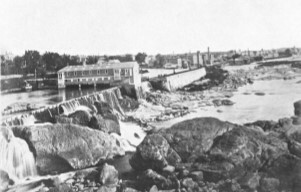 During this time “the most powerful tribes of the interior, and probably of New England, north of the Pequots, had their residence in the valley of the Merrimack, upon the productive falls and fertile meadows of that beautiful river.” The Merrimack afforded superior advantages for Indian settlements the most prominent being the rapids and falls that provided abundant fishing grounds. Spears, dip-nets, seines and weirs allowed the Native Americans to easily catch myriads of alewives, shad, and salmon. The woods along the banks were filled with moose, deer, and bears and the ponds, lakes and sources or its tributaries were teeming with water fowl. Amoskeag Falls after the Native Americans were long gone and industrial development had begun. After the demise of the Native Americans, the rich fishing grounds of the Merrimack fell to the Scotch-Irish and other Europeans until industrial pollution and dams destroyed them. Brad, Might you have any history on the Stone Arch Bridge off of the discontinued part of Gov. Dinsmoor, where the Quarry Brook land is now.